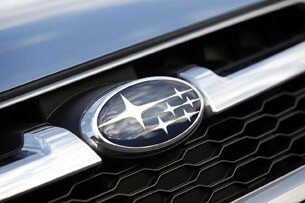 We’ve been quick to rail on the Japanese automaker for building interiors well behind the curve in the past, and it appears Subaru has finally moved to cure that ail. 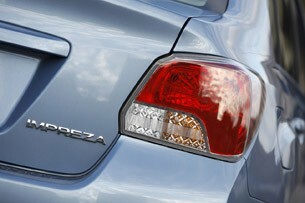 The 2012 Impreza now features a vastly improved material selection inside. The driver gets to enjoy a three-spoke, multi-function steering wheel, and our 2.0 Premium tester came equipped with a very attractive two-tone interior. The dash is covered in squeak-fighting soft-touch materials, and while the center stack isn’t anything we’d consider beautiful, the controls are logically organized and easy to manipulate. 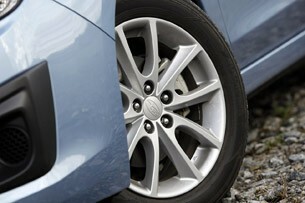 Perhaps the best place to see an improvement is the vehicle’s front door panels. These pieces have been a wasteland of hard plastic in the past, but with soft touch uppers, well-grained plastics and cloth inserts, the panels now use a multitude of materials to improve the overall feel of the cabin. On the whole, the interior is a massive improvement, though it’s a bit sober and lacks cutting-edge infotainment options. Rear passengers are now treated to two-inches of additional leg room over the outgoing model. 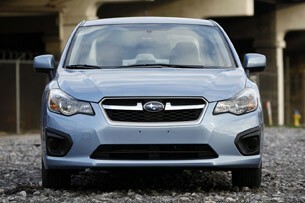 Fortunately, Subaru has also worked to make the 2012 Impreza more accommodating inside. Engineers have stretched the vehicle’s wheelbase by a full inch, and thanks to some clever packaging, rear passengers are now treated to two-inches of additional leg room over the outgoing model. That’s partially due to new scalloped front seatbacks that provide space for knobby knees. Speaking of those front seats, Subaru redesigned the buckets for long-term comfort, and there’s more lumbar support available than in the past. 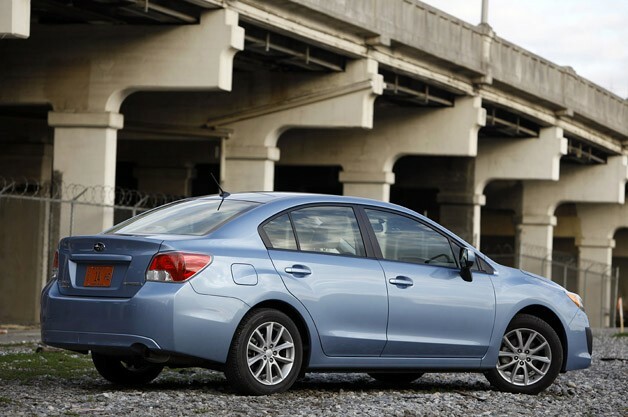 Even the base Impreza is now packed with convenience features, including power windows, locks and side-view mirrors as well as keyless entry. 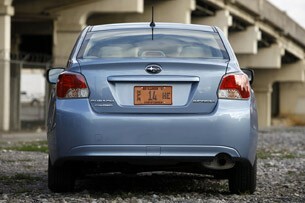 But if there’s a reason to get excited about the 2012 Subaru Impreza, it’s under the vehicle’s hood. 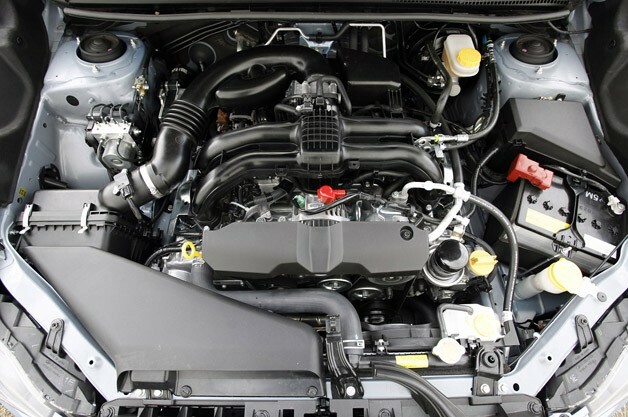 The four-door packs an all-new, dual-overhead cam naturally-aspirated 2.0-liter four-cylinder good for up to 36 mpg according to the Environmental Protection Agency. If that seems a shade low for the compact segment, it pays to keep in mind that this is the only vehicle in the class that comes with all-wheel drive as standard equipment. But that was then. 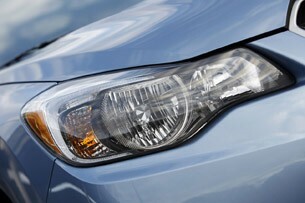 Now, the 2012 Impreza is good for 27 mpg city by the EPA’s reckoning. That’s a massive step up, and during our time with the vehicle, we saw an honest 31.5 mpg combined. 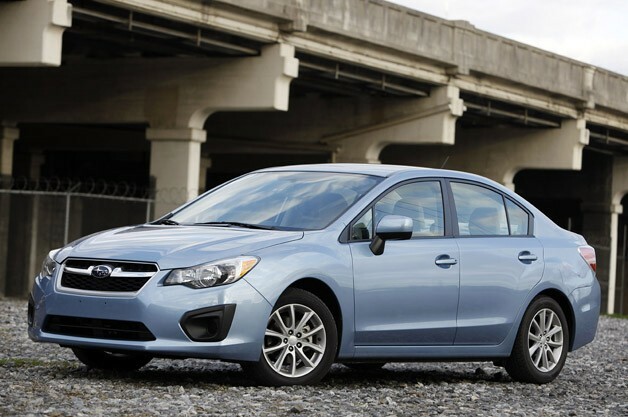 We know previous-generation Impreza owners who would perform all sorts of sinister acts to milk that kind of fuel economy from their thirsty boxer fours. Of course, those numbers come with a sacrifice. At 148 horsepower, the new 2.0-liter four-cylinder engine produces 22 less horsepower than the old 2.5-liter single-overhead cam lump. The story isn’t much better when it comes to torque, with the 2012 model delivering 145 pound-feet to the 2011 version’s 170 pound-feet. So, how does it drive? 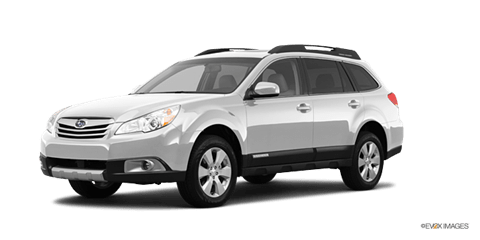 Subaru says that it has worked to improve the vehicle’s noise, vibration and harshness with tricks like hydraulic engine mounts, and it’s true that this is probably the quietest boxer from Subaru we’ve had the pleasure of not hearing for years. That’s particularly impressive given that the company abandoned the typical quiet timing belt in favor of a more durable, but characteristically louder timing chain. By and large, the whole cabin does seem quieter, but the company’s engineers seem to have created a much softer suspension to go along with the decrease in decibels. Interestingly enough, our Premium 2.0 came loaded with a larger rear stabilizer bar than the base model, so we can only assume that our tester should be sharper than the entry-level four-door.